Getting to Hradec Králové from Prague was the easy leg of the trip, only taking one hour and 15 minutes courtesy of the comfortable Student Agency buses with plush seating. I had an hour before my connection, which would take me to Broumov on a journey lasting two and a half hours. I had wanted to visit Broumov for about 10 years, but I was always put off by the four-hour or longer bus ride to get there. I do not like traveling by bus. A four-hour trip seemed too much to bear. This time, though, I was determined finally to see the monastery that many of my friends had praised. Unfortunately, I would not have time to explore any of the rock formations near my destination, a town at the Polish border of northeast Bohemia. My connecting bus pulled up on time. I spent about an hour reading about the monastery’s history. The town, I found out, had been established as far back as the 13th century. The first mentioning of the monastery that I could find came from 1306, when the Benedictines began to run a grammar school there. 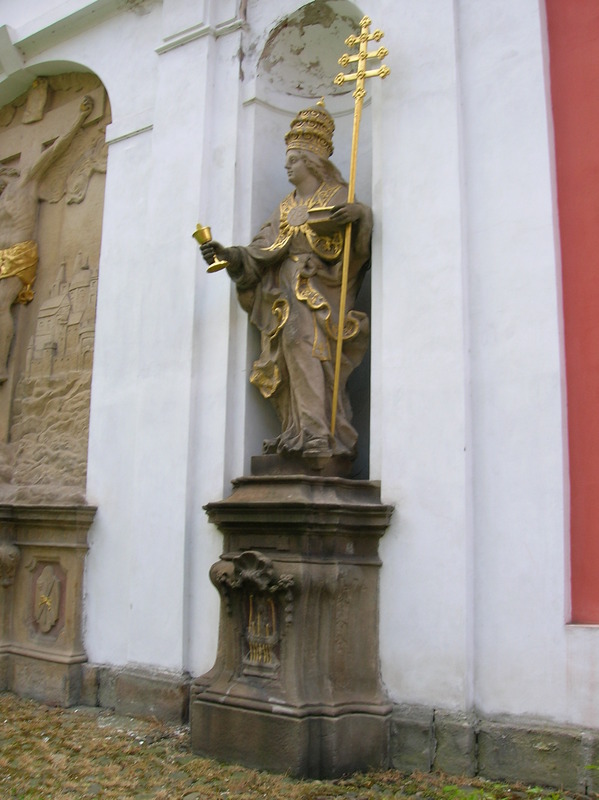 Several of the students would make names for themselves in Czech history: Arnošt of Pardubice, who served as the first Archbishop of Prague during the middle of the 14th century; writer Alois Jirásek; and the first Czechoslovak Minister of Finance, Alois Rašín. The history of the school was fraught with trials and tribulations, though. The Hussites destroyed it during 1420, and the uprising of the Bohemian Estates from 1618 to 1620 during the Thirty Years’ War also forced the school to shut its doors. The history of the uprising was intriguing, to say the least. Holy Roman Emperor Matthias had appointed Ferdinand as his heir, which caused a major fuss among the Protestants because Ferdinand abhorred Protestantism. I also read that in the early 17th century, Protestants constructed their own church near the Lower Gate of the monastery, causing much friction. Even though Emperor Ferdinand II ordered it to be shut down and put some rebels in prison, the church remained open. 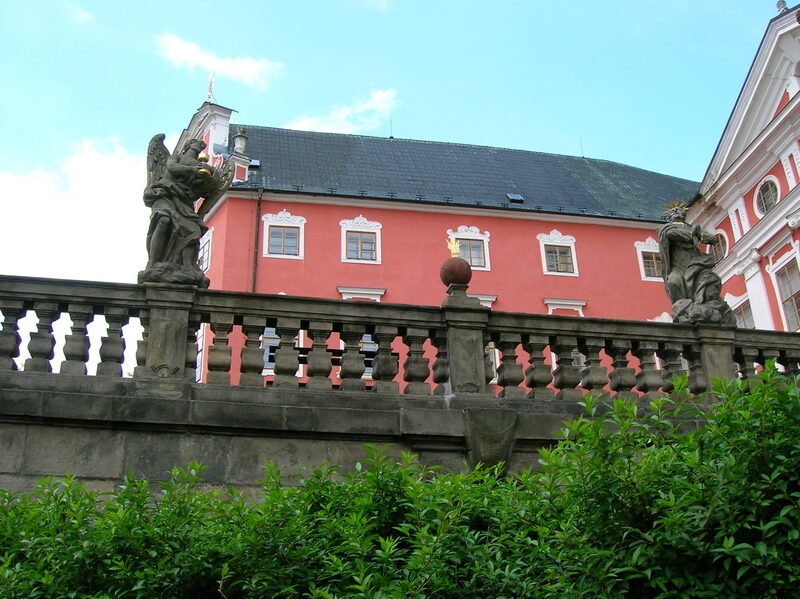 This Catholic-Protestant conflict in Broumov helped instigate the Prague defenestration of vice-governors on May 23, 1618, when the two representatives Ferdinand had sent to oversee the Czech government at Prague Castle were pushed out a window along with the secretary. (They survived because they fell on a pile of horse manure.) This marked the Second Defenestration of Prague and triggered the Bohemian Revolt. That is when the directors of the Bohemian Estates confiscated the monastery, which was purchased by the citizens of the town. The complex was returned to the Benedictines after the Battle of White Mountain in 1620, when the Catholics, led by Holy Roman Emperor Ferdinand II’s army, defeated the Protestant Bohemians. The monastery was in ruins but was restored. The school was not closed again until 1939, when the Nazis controlled the complex. Benedictines from the USA oversaw the monastery from 1945 to 1948, but then the Communists took over, and the American monks went home. During 1950 the monastery became an internment camp for monks. It was not returned to the Benedictines until 1990. To get to the monastery, I had to walk through the main square. Renaissance house number 105 boasted of a portal from 1595. I noticed two buildings in Neo-Renaissance style as well. The monastery was practically on the square. I purchased my ticket and gazed at the Baroque statues of saints on the balustrade of the monastery’s terrace before the tour began. Saint Prokop, in almost fluttering drapery, proudly gripped a cross. The Baroque masterpieces seemed to twist and turn on their own and gave the exterior a dramatic and dynamic atmosphere. First, we entered the Church of Saint Vojtěch (Adalbert) – a Baroque wonderland thanks to Italian builder Martin Allio and the Dientzenhofer team of father Kryštof and son Kilián Ignáz during the 18th century. 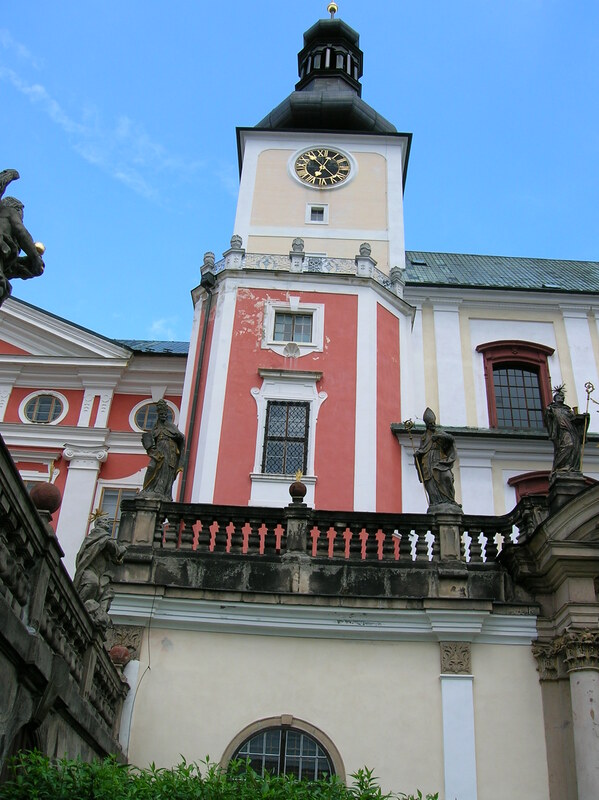 (The Dientzenhofers remodeled the other monastery buildings in Baroque style as well.) I was overwhelmed by the pink fresco-filled ceiling with white stucco décor. I felt dizzy with awe as I peered at the fresco showing the death of Saint Vojtěch. In the Saint Benedict Chapel, white angels fluttered amidst spiraling pink columns. 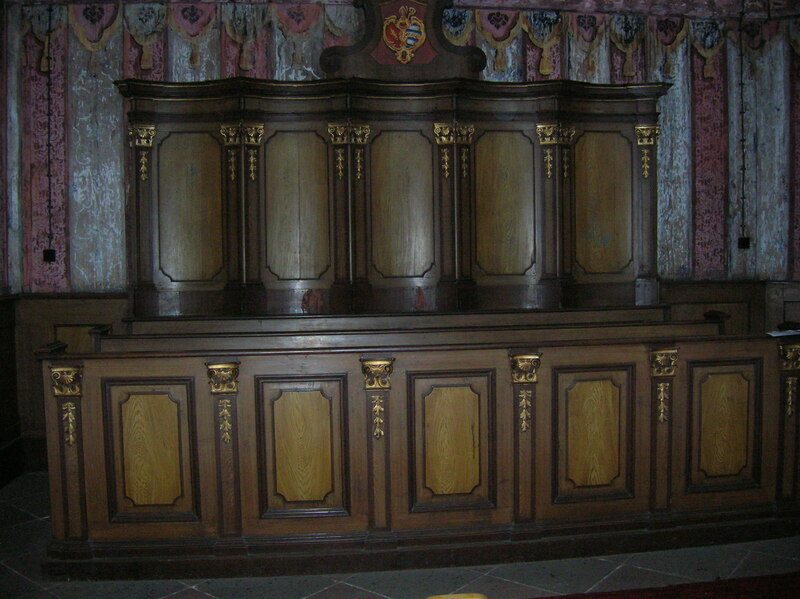 In the choir I admired the carved wooden benches with gold decoration as well as the frescoes above them. The 20-something guide with long blond hair pointed out a rendering of “The Last Supper”. The main altar, dating from 1706, was not disappointing, either. 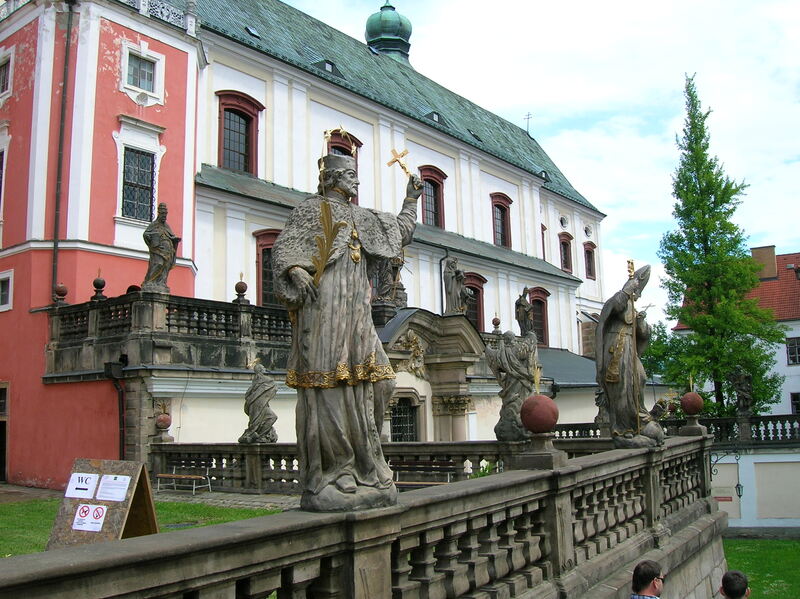 Flanked by Saint Václav (Wenceslas) and Saint John of Nepomuk, Saint Vojtěch stands proudly in the middle. Next, we went upstairs to the library – one of my favorite rooms on any tour. Originally, there were three libraries with a total of 67,000 books, but now only one remained, and the number of books has dwindled to 17,000. The guide explained that during the totalitarian regime, Communists threw books out the window. Other books went to Prague, and still others were stolen. I tried to imagine someone hurling these exquisite volumes outside, but it was too painful. It was just one of the many ways that the Communists tried to suffocate Czech culture. Once again, I was reminded of how horrific the totalitarian era was. The reading material that remained was written in Latin, Spanish, French and Czech, among other languages. The books dealt with subjects such as law and history, the guide remarked, showing us a seven-volume set of The Old Testament, which made up the heaviest books. Each weighed 20 kilograms. I was moved by the portraits decorating the balustrade and the frescoes that adorned the ceiling. The illustrated manuscripts featured in display cases were a treat, too. Downstairs to the first floor, we entered the refectory. 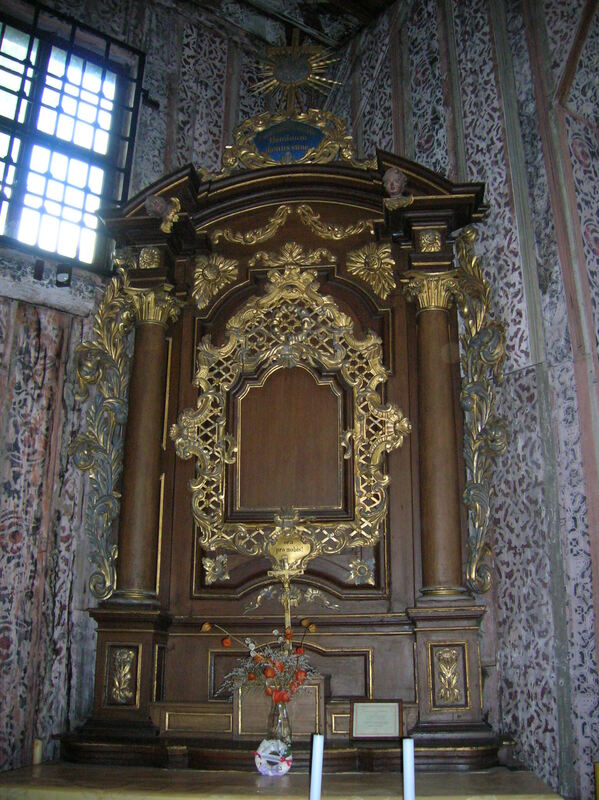 The treasure in the room was one of 40 copies of the Shroud of Turin, discovered in the Saint Cross chapel during 1999. What a day that must have been! Imagine discovering a 17th century relic three centuries later! Supposedly, Jesus Christ was wrapped in the original shroud after his body was taken down from the cross. Those who believe in its authenticity argue that an impression of a coin circulated at the time of Jesus of Nazareth’s death was shown on one of the eyes. Originally kept in Constantinople, it has been stored in Turin since the 16th century. Made in 1651, this copy – the only one found north of the Alps – was a gift to Broumov Abbot Sobek of Bílenberk from Turin Bishop Bergirius. The shroud featured a brown impression of Christ’s body with a light outline. For some reason I had expected the impression to be more pronounced and the outline more visible, darker. Still, it was exciting to be able to see such a significant piece. In the corridor we stopped at three charts on boards. One denoted events from the 19th century, marking that the cholera epidemic had ravaged the region during 1836. A board from 1812 showed that hop-plant was the most expensive product that year. Then the tour guide asked who wanted to see the mummies. I did not know anything about any mummies there, but, curious, I tagged along with two others. We walked deep down into the crypt. In two spaces I saw 20 mummies of 17th and 18th century townspeople in open coffins. There were 32 mummies in all, but only 20 were on display, the guide remarked. Then she explained that due to renovation work in Vamberk, the mummies had been kept here since 2000. She did not know when they would return home. I was aghast that the mummies were so small, the size of children rather than most adults. For a moment I was brooding and philosophical. I wondered if that is all there is after life. You wind up in a coffin, there is no God, no Heaven. You are stuck in a dark place for eternity. Moved by the sight of the open caskets, I tried not to dwell on those depressing thoughts and instead marveled at the mummies’ preservation. The tour ended, and I went to the museum in the monastery, six halls focusing on 700 years of the Broumov region’s rich history. Gothic, Renaissance and Baroque objects were just a few of the attractions. Weapons, folk nativity scenes, shooting targets and regional folk costumes rounded out the permanent exhibition. There was also an exhibition of clocks – from ornate Baroque clocks to 20th century alarm clocks. The most intriguing object for me was the poster announcing that this region – the former Sudetenland with a German majority – was being incorporated into The Third Reich. The German citizens had been enthusiastic about it, I remember reading. They had welcomed the Munich Agreement of 1938 that ceded Czechoslovakia’s Sudetenland to Hitler. And I thought of the Beneš decrees instigated after World War II when Czechoslovak President Edvard Beneš expelled all Germans from the Sudetenland. History had certainly made a poignant mark on this seemingly tranquil town. Looking at that poster, I saw the brutality of 20th century events that had seeped throughout the region. Next, I made my way toward the hospital. 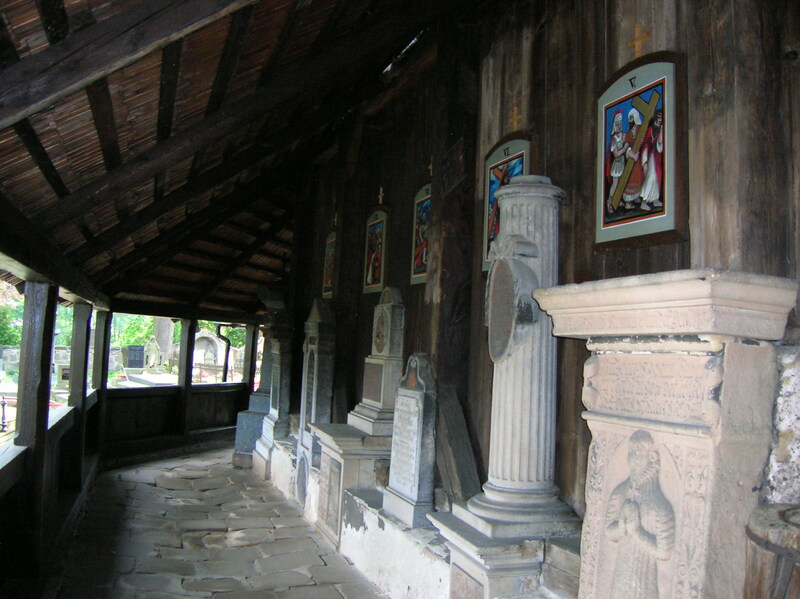 Across the street was a small cemetery with an exquisite wooden church – the Church of the Virgin Mary – that is the oldest preserved all-wood construction in Central Europe. There may have been a church on this site as far back as the 12th century, when this part of town made up a village. Legend has it that the church was built by a pagan princess during 1171. However, the first written documentation of its existence dates from 1383. 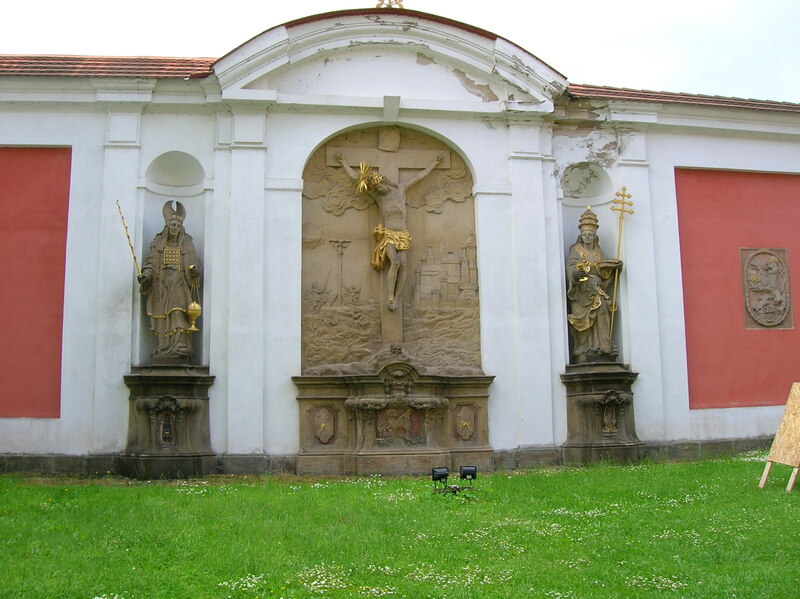 In 1421 the church was destroyed by the Hussites, though the extent of the destruction is uncertain. The current church was constructed by the Benedictines in 1449. The Gothic structure had a single nave with a trihedral end and a steep gabled roof. A pyramid steeple punctuated the building. The ground floor was surrounded by an open gallery, and the interior was covered with planks. The art work was incredible. There was a remarkable stencil mural on a wall. I admired the black stencil motifs of geometric shapes and vegetables on the ceiling and walls, too. The main altar depicted the Virgin Mary looking up to Heaven, surrounded by a gold frame supported by two angels. Two columns were situated behind the angels. A huge halo dominated the top of the exquisite structure. After spending about a half hour in that modest yet fascinating architectural gem, I had lunch in a hotel restaurant with a garden and terrace. There was a fountain and statuary in the garden that seemed to belong to a palace. The prices were the same as the pizzeria I often visited in downtown Prague, yet the dining atmosphere was much classier. I felt as if I were at a resort. My stomach filled with delicious chicken and diet Coke, I walked around the corner to the bus stop. It would be a four-hour journey back to Prague on the direct bus. I was surprised to find out that there was no break during the trip, such as a 10-minute interval to use the bathrooms. I did have five minutes in Náchod, though, where I raced around the corner to the train station restroom and made it back with a minute to spare. While the skies had foreshadowed rain during my entire trip, it did not start pouring until I got off the bus at the Černý Most Metro station in Prague. Still, nothing could damper my excitement about a trip that had been well worth the arduous journey.